Our Abpromise guarantee covers the use of ab25138 in the following tested applications. ELISA Use a concentration of 0.5 µg/ml. Using 100 µl/well of antibody solution, allows the detection of 0.2-0.4 ng/well of recombinant human Galectin 1. WB Use a concentration of 0.1 - 0.2 µg/ml. Detects a band of approximately 14 kDa (predicted molecular weight: 14 kDa). The detection limit for recombinant human Galectin 1 is 1.5 - 3.0 ng/lane, under either reducing or non-reducing conditions. Additional bands at: 32 kDa, 45 kDa, 73 kDa. We are unsure as to the identity of these extra bands. ICC/IF image of ab25138 stained Hek293 cells. The cells were 4% PFA fixed (10 min) and then incubated in 1%BSA / 10% normal goat serum / 0.3M glycine in 0.1% PBS-Tween for 1h to permeabilise the cells and block non-specific protein-protein interactions. The cells were then incubated with the antibody (ab25138, 1µg/ml) overnight at +4°C. The secondary antibody (green) was Alexa Fluor® 488 goat anti-rabbit IgG (H+L) used at a 1/1000 dilution for 1h. Alexa Fluor® 594 WGA was used to label plasma membranes (red) at a 1/200 dilution for 1h. DAPI was used to stain the cell nuclei (blue) at a concentration of 1.43µM. IHC image of ab25138 staining in human normal kidney formalin fixed paraffin embedded tissue section, performed on a Leica BondTM system using the standard protocol F. The section was pre-treated using heat mediated antigen retrieval with sodium citrate buffer (pH6, epitope retrieval solution 1) for 20 mins. The section was then incubated with ab25138, 1µg/ml, for 15 mins at room temperature and detected using an HRP conjugated compact polymer system. DAB was used as the chromogen. The section was then counterstained with haematoxylin and mounted with DPX. ab25138 staining Galectin 1 in Human umbilical cord blood mescenchymal stem cells by Flow Cytometry. Cells were fixed with formaldehyde. The sample was incubated with the primary antibody (1/100 in PBS + 1% BSA) for 30 minutes at 4°C. An Alexa Fluor® 488-conjugated goat anti-rabbit IgG polycloanl (1/2000) was used as the secondary antibody. Purple - isotype control, Green - Galectin 1.
ab25138 staining Galectin-1 in Human cervical cancer tissue sections by Immunohistochemistry (IHC-P - paraformaldehyde-fixed, paraffin-embedded sections). Samples were incubated with primary antibody (1/1000 in 1% BSA in PBS) overnight at room temperature. An Alexa Fluor A647-conjugated Donkey anti-rabbit polyclonal (1/200) was used as the secondary antibody. Representative images from double stainings of Galectin-1 and CD163. Arrows indicate examples of double positive cells. Representative images from double stainings of Galectin-1 and CD3. Recently I purchased anti-galectin-3 antibody (ab118851), which is to be used in an ELISA type of assay. In order to confirm the reactivity I performed a positive control so see whether the antibody recognizes FITC labeled humanGal-3. It appears that the antibody does not recognize the protein however. 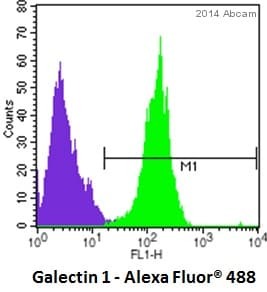 Anti-galectin-1 antibody (ab25138) does recognize its FITC labeled protein Gal-1. Have you heard this before? Is there another type of antibody that should work better? I hope to hear from you soon. Thank you. Conditions: 2% BSA block, 1 ug antibody used, 250 ng protein. Having a short look at the two datasheets and particularly at the immunogens, I noticed that ab25138 is directed against the whole galectin-1 protein, whereas ab118851 detects an internal sequence of the protein. ELISA is usually performed under non- reducing and denaturing conditions, so it may be that the relatively small epitope for ab118851 is simply covered- up by thehuge FITC protein. However, I rather gather some more detailed information regarding your protocol before I come to any conclusion. Pas de problème, j'ai donc demandé à notre service comptabilité de mettre en place un avoir, référence CN est ****** (pour le ab94571). Voici les manières dont vous pouvez utiliser cette référence CN: (1) la faire valoir contre la facture originale si celle-ci n'as pas encore été payée (2) la faire valoir contre une prochaine facture (3) obtenir un remboursement de la somme entière si vous n'avez pas de factures actuellement en cours avec Abcam Si vous souhaitez recevoir un remboursement au lieu d'un avoir, veuillez demander à votre service de gestion de prendre contact avec notre département comptabilité afin que nous puissions recueillir les informations nécessaires pour cette restitution. Notre service comptabilité peut être contacté par courriel à l'adresse creditcontrol@abcam.com ou par téléphone en utilisant le lien « Contactez-nous » dans le coin en haut à droite de notre site internet. Veuillez communiquer votre numéro d'avoir lorsque vous contactez notre service comptabilité. Vous recevrez également la référence complète de la note de crédit par courriel ou par voie postale; cette référence commençant par les lettres CGB. Concernant l'anti-galectine 1 (ab25138), le numéro de commande de remplacement gratuit de ce produit par uine unité de ab58085 est ********. Vous recevrez prochainement un mail de confirmation comprenant les détails d'expédition. L'équipe technique reste à votre disposition pour plus de conseils. Bonne continuation dans votre recherche. Bonjour, effectivement les deux anticorps (galectin-1 et isocitrate dehydrogenase) ne fonctionnent pas en westernblot sur des échantillons humains. Nous l'avons aussi testé sur des lignées cellulaires (sein, leucémie...) sans succès également. Nous avons à chaque fois réalisé plusieurs protocoles (blocage 5% lait ou BSA, incubation 2h RT ou ON 4°C, dilutions différentes...)sans résultats positifs. Après vous avoir contacter une première fois, vous nous avez renvoyé deux autres anticorps: le même clone et même lot pour la galectin-1, et le même clone mais un lot différent pour l'isocitrate. Ces deux nouveaux anticorps nous ont donné les mêmes résultats négatifs qu'auparavant. Merci pour ces informations. Je suis désolé d'apprendre qu'aucun des 2 anticorps de remplacement n'a fonctionné en western blot sur échantillons humains. Pour des raisons de qualité, j'ai transmis vos données et commentaires au laboratoire afin que des tests supplémentaires soient entrepris pour ces 2 références. Afin de résoudre ce problème le plus rapidement possible, pourriez-vous m'indiquer si vous préférez recevoir un avoir ou un remboursement contre la commande originale ou un remplacement avec des anticorps différents? Pour la détection de la Galectine 1 humaine en western blot, nous avons les 5 anticorps suivants (testés WB et humain) : •	ab108389, rabbit monoclonal, www.abcam.com/ab108389 •	ab38328, rabbit polyclonal, www.abcam.com/ab38328 •	ab114087, goat polyclonal, www.abcam.com/ab114087 •	ab58085, mouse monoclonal, www.abcam.com/ab58085 •	ab112525, rabbit polyclonal, www.abcam.com/ab112525 Pour la détection de la isocitrate deshydrogenase humaine en western blot, nous avons les 5 anticorps suivants (testés WB et humain) : •	ab117976, mouse monoclonal, www.abcam.com/ab117976 •	ab113232, rabbit polyclonal, www.abcam.com/ab113232 •	ab81653, rabbit polyclonal, www.abcam.com/ab81653 •	ab85532, rabbit polyclonal, www.abcam.com/ab85532 •	ab117539, rabbit polyclonal, www.abcam.com/ab117539 Merci de me confirmer la résolution qui vous conviendra le mieux. DISCOUNT CODE: xxxxxxxxxxx Expiration date: 14-01-2012 I am very pleased to hear you would like to accept our offer and test ab25138 in Flow Cytometry. This code will give you 1 free PRIMARY ANTIBODY before the expiration date. To redeem this offer, please submit an Abreview for Flow Cytometry and include this code in the “Additional Comments” section so we know the Abreview is for this promotion. Remember, we publish both positive and negative Abreviews on our datasheets so please submit the results of your tests. The code will be active once the Abreview has been submitted and can be redeemed in one of the following ways: 1) Call to place your order and mention the code to our customer service department; 2) Include the code in your fax order; 3) Place your order on the web and enter the promotional code. Any feedback that you can provide will be greatly appreciated, whether positive or negative. If you have any further questions, please do not hesitate to contact us. We look forward to receiving your Abreview and wish you luck with your research. The terms and conditions applicable to this offer can be found here: www.abcam.com/collaborationdiscount. Thank you very much for your interest in ab25138. To our knowledge, ab25138 has not been tested in Flow Cytometry. Therefore, I can offer a discount off a future purchase if you buy ab25138 now, test it in Flow and submit feedback to us in the form of an Abreview. It doesn’t matter whether the Abreview is positive or negative, we would just really like to receive your feedback. The discount would be to the value of 1 free PRIMARY ANTIBODY. If you are interested in this offer, please follow these steps: 1. Reply to this e-mail to let me know that you would like to proceed and test ab25138 in Flow. I will then send a discount code. This code must be issued before purchasing ab25138 so please wait for my reply before ordering. 2. Purchase ab25138 either by phone, fax, or online (www.abcam.com). 3. Test it in Flow. 4. Let us know the results, positive or negative, using our Abreview system (this will take about 10 minutes and images are great if you have them!). To find out more about our Abreview system, please visit: https://www.abcam.com/abreviews. 5. After the review is submitted to us, the discount code becomes active. Simply place your new order by phone, fax, or on the web and mention the discount code. The discount can be redeemed for any PRIMARY ANTIBODY ordered and the discount code is valid for 4 months after issue. We are always pleased to obtain feedback about our products and any information is greatly appreciated! Even if ab25138 turns out to be unsuitable for Flow, you will still receive the discount on your next purchase after your Abreview has been submitted. Please let me know if you have any questions about this offer and I would be happy to help you further. The Terms and Conditions of this offer can be found at: www.abcam.com/collaborationdiscount.